It is important to make the distinction between music and sound. A separate, but related, discussion would deal with the potential for creating new kinds of avant-garde music within this realm (check out here  and here ), but that’s not what I’m talking about. Data sonification is simply the auditory equivalent of data visualization. Yes, some visual data is certainly striking in its beauty, but aesthetic value and scientific value are mutually exclusive. In recent years, data sonification has been applied especially in biomedical disciplines (e.g., here and here), but what about the geosciences? What data types in geoscience would be amenable to being listened to? One answer to why we haven’t seen the value of data sonification demonstrated in this regard is because it has none. This approach can most easily be applied with time series data (and potentially ‘thickness series’ data as I discuss below) but what about spatial information? My intuition is that turning spatial data into something that one can listen to would create something extremely difficult to interpret. I listened to some of the data from the above project and I have to say I was underwhelmed. It should be noted, however, that I am currently sitting in a room where clicking, whooshing, and otherwise white-noiseing of a magical machine that knows when a zircon was born is overpowering all other sound. Additionally, this particular dataset is a gradual and subtle crecsendo…all-in-all, not a very exciting pattern. That being said, one of the objectives of what they are doing is to figure out a workflow. Perhaps the value might be when multiple sections are combined? I don’t know. This is one of those topics that is perfect for a blog because I’d like to hear what people think. Do you think your particular type of data could be converted to sound and be of any use? Record the different “thock” sounds the defferent strata make when hammered. I’m taking a seminar on computer music composition this quarter, and one of the chapters in our textbook is about taking data from some non-music field and converting it to sound. We haven’t gotten to that point yet (the class hasn’t even met properly yet! ), but as soon as I saw it in there, I started thinking of how I could work some earthquakes into my final project for the class. I’m guessing that might be more straightforward than trying to turn stratigraphic layers into sound, since there’s no converting to waveforms involved. 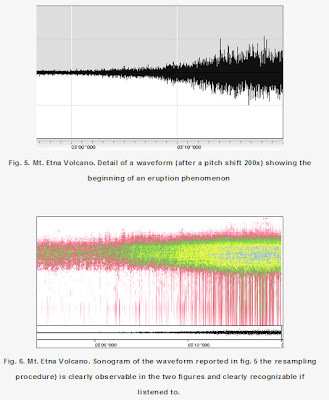 I’m hoping there will be some other way to use seismic data (or your Etna data) than just plunking the waveform into a sound editor directly, particularly since the plunking has already been done. I have a feeling this is a topic that’s going to be turning up in my blog as the class progresses. For the vertical stratigraphic successions, I suppose you could flip it on its side, trace the contour, and turn that into a waveform. People have done that sort of thing with city skylines or mountain range silhouettes. But maybe you could take the values for lithology, grain size, bed thickness, and so on, and set them up as attack, sustain, and decay values for sound envelopes, one envelope per layer. Belatedly, I’ll definitely keep you posted. So far, we’re still in the “here’s how to use this software” phase of the class, though.